Download Fright Night in Digital HD from the iTunes store. Fright Night images are © DreamWorks Studios. All Rights Reserved. The scary, seething, suspenseful, gory, horror filled Fright Night left me turning my head on my way to the car following the showing. It's a frightening flick that takes its toll on those that can have a love for the thrills that evil can provide. You don't have to be Goth to enjoy, just a sense of humor and a need to feed your bloody thirst for a good horror movie. Charley (Anton Yelchin) has finally made it to the in crowd in his senior year at his local high school. He's got the top girl Amy (Imogen Poots), cool duds and the guys respect him, what more can a teen want. How about some thrills, just what Charley needs, right? Well he's about to get his fill when Jerry (Colin Farrell) a vampire moves in next door and starts raiding the neighborhood for ‘food'. When his former best friend Ed (Christopher Mintz-Plasse) comes up missing, Charley tries to convince his mother and girlfriend that evil lurks in the house on the left. Luckily Peter Vincent (David Tennant), the vampire killer is in town performing his magic show. I am a huge horror fan and I've seen the 1985 original starring Chris Sarandon as Jerry and Roddy McDowall as Peter Vincent and loved it even though it didn't have all the special effects that ramp up this version. 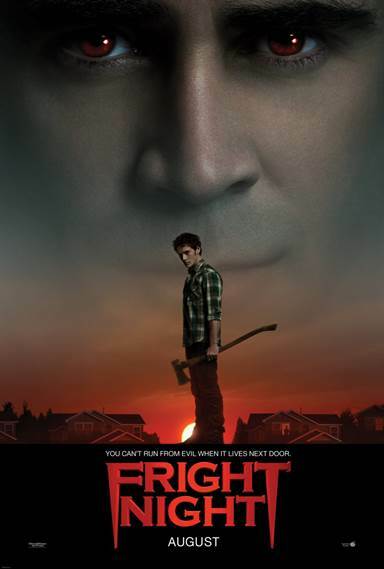 The remake of Fright Night does have much of the comedy as the first except here they use it as a relief from the horror where in Tom Holland's it was more of a tongue in cheek campy kind of fun. While this one has a LOT more horror and suspense, it wouldn't be a bad idea to rent the original for some good laughs, but not before seeing the remake. The performance by Colin Ferrell as the relentless blood lusting ghoul is chillingly terrific and most times terrifying. He brings to Jerry a wicked smile and evil eyes that makes his character very creepy and spine chilling, just what's needed to carry off the menacing plot. Director Craig Gillespie does a great job of infusing the intermittent laughs with the help of Christopher Mintz-Plasse as Charley's nerdy best friend Ed who steel many scenes while trying to escape the clutches of the vampire. Gillespie lays out his story and gets to the meat of it in a very nice fashion leaving no time to make his audience think of other films that may be similar. He charges right in letting you know who the vampire is and what kind of mayhem he's taking to the neighborhood. Fright Night images © DreamWorks Studios. All Rights Reserved.